There was a time in America when young guys formed groups on street corners and sang their own style of music, most commonly known as Doo-Wop. 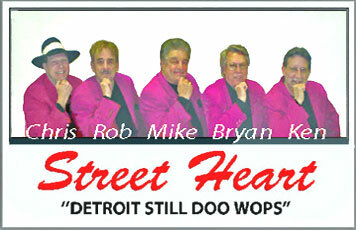 Street Heart has been singing streetcorner harmony for over 16 years. With their distinctive rich harmonies the group has entertained thousands of fans in the Metro Detroit area. Street Heart - Click for audio 1 / 2.